Sierra Nevada Working On Dream Chaser Space Plane for Unmanned and Manned Missions to the International Space Station. Since the U.S. Space Shuttle program was ended in 2011 after one hundred and thirty five missions, the U.S. has had to rely on the launch capabilities of Russia in order to ferry astronauts to the International Space Station. Since retiring the Space Shuttle, NASA has been working with private contractors to develop a new space plane to carry astronauts and supplies to orbit. 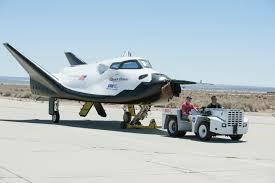 One of the space planes under development is known as the Dream Chaser (DC) spacecraft by Sierra Nevada. The Dream Chaser is thirty feet long which is about one fourth of the length of the Space Shuttle. It will be able to lift about twelve thousand pounds of cargo into space. It can be launched on top of a rocket but it will be able to return from space on its own and land on a runway like the Space Shuttle. In October of 2013, the Dream Chaser was undergoing its first approach-and-landing test at Edwards AFB. The DC successfully executed the glide portion of the test. But, when it was landing, the left main landing gear failed to deploy as designed and the DC skidded of the runway. Sierra Nevada was competing against Boeing and SpaceX as part of NASA’s Commercial Crew Program to ferry astronauts to the ISS. About a year after the crash, the DC was removed from the fourth and final round of the program. Boeing and SpaceX were awarded contracts to develop the new manned space plane. Despite being dropped from the Commercial Crew Program, Sierra Nevada continued work on the DC for manned and unmanned missions. In January of 2016, Sierra Nevada was awarded a NASA commercial resupply contract for the ISS along with SpaceX and Orbital ATK. This contract is for unmanned cargo flights only. The DC will have a special cargo module attached to it for the launch and rendezvous with the ISS. Following separation from the ISS, the cargo module will detach and burn up in the Earth’s atmosphere during reentry. The crew of the ISS will be able to use this cargo module to remove waste and used equipment from the ISS. The DC will then glide down and land at the former Shuttle Landing Facility at the NASA’s Kennedy Space Center in Florida. After four years of further work following the 2013 crash, the Dream Chaser prototype was delivered to NASA Armstrong last January for a series to test which included two captive-carry tests. Today a captive-carry test was executed by attaching a DC to a Columbia 234-UT helicopter. The two craft spent about an hour and three quarters flying around above Rogers Dry Lake before landing with the DC landing gear extended. The test was a complete success. Next test for the DC will be what is known as a free-flight test. The DC will be taken up to about twelve thousand feed and released so it can glide back to earth and land. Sierra Nevada continues to work on the development of a DC for manned flights under an unfunded Space Act Agreement. This manned DC will be able to carry up to seven astronauts to the ISS. Sierra Nevada is pursuing private funding to continue work on the manned D.C.